Throughout my twenty two years as a municipal candidate and elected official in West Vancouver, I have found the Citizens for Good Government to be dedicated to their constitution and their community. They have made a consistent effort to recruit, interview and endorse candidates for office who they believe best suited to govern in West Vancouver. Candidates may choose to participate in the process, and if endorsed by the membership at large, will be assisted in group advertising to all residents prior to the municipal election. I have always been impressed with the amount of time and effort brought by the Directors of this association to their task. Endorsed candidates demonstrate a range of perspectives on community issues and remain independent of one another and of the Citizens for Good Government. I believe this independence is important for West Vancouver to remain one of the few municipalities free from Political Party slates and restrictions. -Mark Sager, former Mayor of WV, Chairman Police Board, Chairman of School Board, and many WV and Lower Mainland organizations. It is critical that West Vancouver have a mayor and council that can deliver on the taxpayers’ vision our community. The Citizens for Good Government has played an important role over the years in assisting voters to evaluate and identify candidates most likely to provide the needed leadership. A good deal of time and commitment is required to meet with candidates and determine which have an understanding of issues, the capability to make appropriate decisions and the energy to build our West Vancouver. 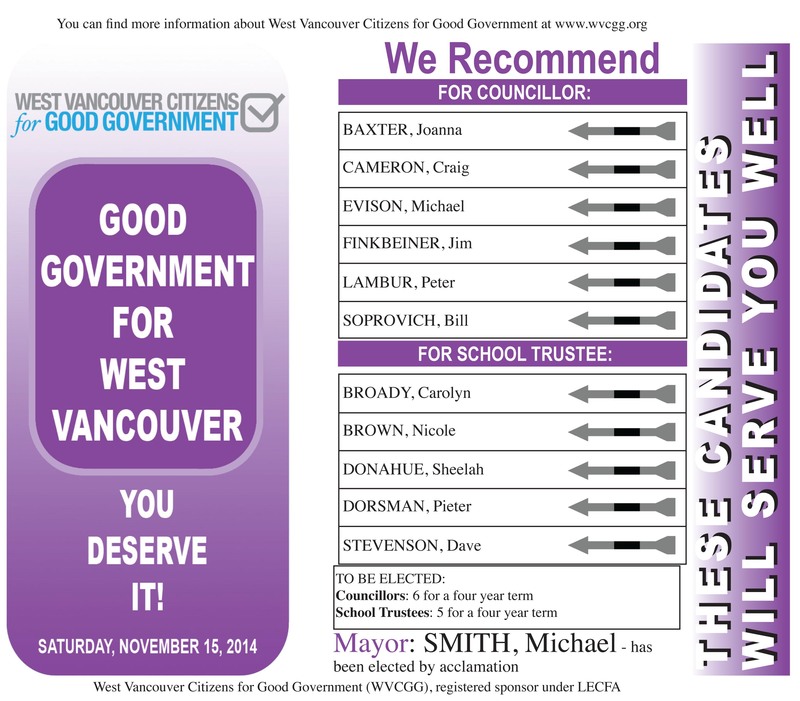 I am grateful to the Citizens’ executive who work to make West Vancouver’s Council as strong as it can be. Elections are challenging for all of us. Nationally and provincially, we rely on political parties to help us to select people who reflect our ideologies and beliefs. Happily, we do not have political parties locally in West Van but we do have the WVCGG to help us to select people who are thoughtful, prepared and dedicated to our quality of life, regardless of political ideology or viewpoint on any one specific issue. As a former school board trustee and chair, and municipal councilor, as well as former WVCGG board member, I have been on both sides of the table and appreciate the thoroughness of the WVCGG review of candidates. They may not make up my mind for me but they certainly make me pause and think about why I would not vote for a candidate who has been vetted for their commitment and knowledge. -Ken Haycock: former Councillor, West Vancouver Library Board, School Trustee for six years, chair for three years, Chair Kay Meek Centre. The members reflected a broad cross section of the people of West Vancouver. The Board worked diligently in the review and selection of the best possible candidates for Mayor and Council. The purpose was to avoid creating a political party through careful selection of quality people. -Jim Carter: Past president of the West Vancouver Historical Society, former Principal of West Vancouver and Sentinel Secondary School, former Deputy Minister of Education and Social Services and Housing, past member of the Board of Directors of the WVCGG.